1517/5000 The exhibition focuses on the 21 woodcuts designed and created by Gauguin specifically to illustrate his first Polynesian diary and printed by his friend Daniel de Monfreid. 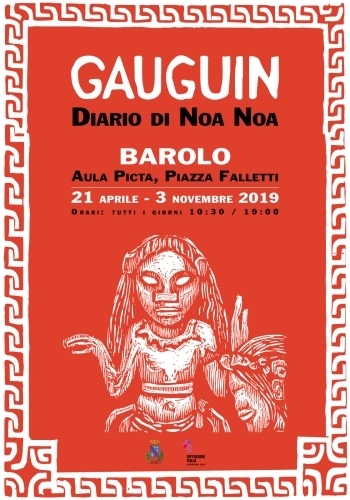 The works exhibited in Barolo enclose the whole wild, primitive and shamanic world, which impressed and deeply inspired Gauguin's art. Together with the magical woodcuts, two extraordinary sculptural works will also be exhibited, a terracotta called "Hina et Tifatou" or "Vase aux Quatre Dieux" of which a specimen is kept at the Musée d'Orsay and which, recently, was exhibited at the MoMA of New York. In Barolo, it will be flanked by a bronze "Tii à la coquille" or "Idole à la coquille" taken from carved wood, in 1896 and currently kept, also, at the Musée D’Orsay in Paris. Among the works on display, there is also an extraordinary drawing "Studio di braccia" saved by the burning of his possessions, ordered by the authorities at his death. The double face drawing, "Study of arms and hands" and shown here with its monotype complete this superb exhibition which also includes twenty lithographs printed in 1914 to illustrate "Avant et Après" the confession book, written by Gauguin and finished in 1903, a few days before his death. Documents, photographs, books, including the first edition of Noa Noa published in "La Revue Blanche" in 1897 complete a cultured, engaging, refined exhibition that is well-known to the noble wine that gives its name to this delightful town, pearl of Langhe.